A high performance HEPA filter coated with silver, an eco friendly and non-toxic substance naturally provides anti-bacterial, anti-fungal and anti-viral protection. The Silver HEPA filter has been proven to reduce up to 50% of airborne viruses that cause the flu in independent lab testing and 98% of bacteria. This filter fits the A350 air purifier. 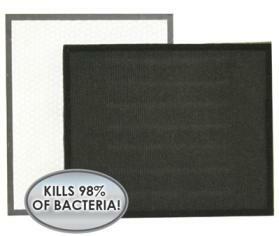 Can eliminate up to 98% of airborne bacteria and up to 50% of viruses that cause the flu.